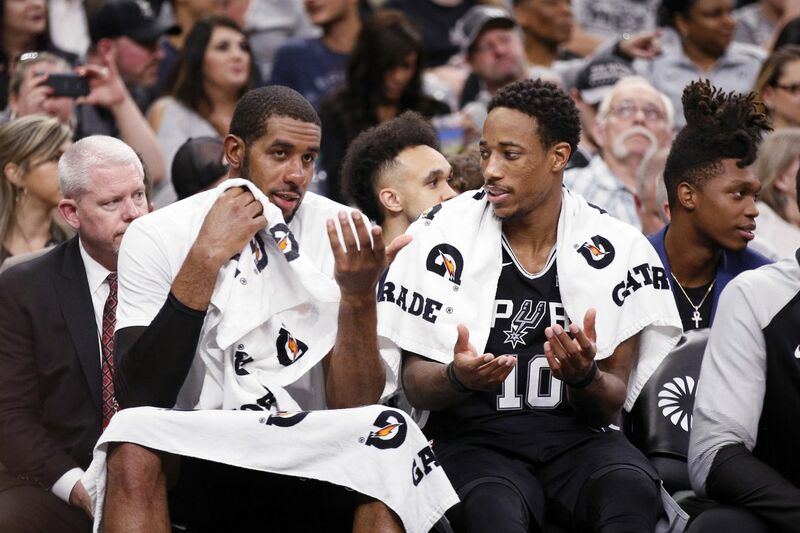 In this week’s staff roundtable, we take on the five biggest questions affecting the Spurs. The Spurs are looking better than many expected this season, but it hasn’t some without a cost as three players are already missing time this season. For the first time year Rudy Gay took a night off for lingering heel pain. At the same time, DeMar DeRozan and LaMarcus Aldridge are playing more minutes than anyone else in the league. DeRozan was bound to have more playing time as three guards are currently out, but Jakob Poeltl, Chimezie Metu, and Drew Eubanks ride the pine while Aldridge has faced bigger lineups alone. The Western Conference continues to look odd, with Houston in the lower third of the league, Sacramento holding a winning record, and Denver playing like a contender. In this week’s roundtable, PtR contributors Jesus Gomez, Mark Barrington, Marilyn Dubinski, Bruno Passos, and editor-in-chief J.R. Wilco discuss the Spurs’ defensive evolution, Pop’s player rotations, and the NBA’s most surprising season starts. Questions were posed on Sunday. For conversation regarding the Miami Heat and Houston Rockets games, check back next week. The Spurs rank 16th in defensive efficiency after being one of the worst defensive teams in the league in their first few games. Will they continue to climb the rankings, will they drop, or will they stay at around this range? Jesus Gomez: I think they’ll hover around the middle of the pack. I’d love to see them get a little higher in the ranking, but that would likely take better, transition defense and for Derrick White to have a bigger impact than I think he will on that end. I wouldn’t be shocked if they sneaked in the top 10, but I’m not counting on it. Mark Barrington: They should gravitate towards the top third, especially since Derrick White is returning. They won’t break the top 10 with their current roster, though. DeRozan is a better defender than I thought, but he’s still no Danny Green on defense. He’s also not Danny on offense, which is great when you need someone to create their own shot. I expect the Spurs will settle in somewhere between 11-16 by the end of the season. Marilyn Dubinski: I would expect them to stay in the middle tier of the league (a.k.a 11-20). They don’t have the personnel to be a truly elite defense, but Pop seems to have found a good balance by inserting Dante Cunningham into the starting unit while getting max effort (most of the time) from even his more limited defenders. If they can end up on the good side of 15th in the league by season’s end, it will be quite an accomplishment relative to expectations and just another testament to Pop’s coaching acumen. Bruno Passos: Middle of the pack defensively is better than a lot of people thought of this group on paper going into the season, post-Dejounte Murray injury. I’m going to guess they finish somewhere around 12th when it’s all said and done, as the chemistry and system familiarity improve. If they find their way into the top 10, I’ll be pleasantly surprised. J.R. Wilco: San Antonio’s defense consistently ranked among the best in the league when Pop had good to great defenders. Now that he has (at best) below-average to good defenders, it’ll be amazing if he’s able to craft them into anything better than league average. It’s a testament to the system if they end up in the top half. If they approach the top 10, it will once again be time to promote him for CotY. DeMar DeRozan averages 37 minutes per game and LaMarcus Aldridge averages over 35. Is Pop playing them too much? Are there any adjustments that could be made to limit their minutes? Gomez: We are not used to stars playing heavy minutes, but it’s not all that rare. Aldridge averaged 35 minutes a game for his career before joining the Spurs. DeRozan averaged over 34 a game. So this is not all that unusual for them. That being said, Aldridge is a little older now, so I think Pop will try to get his minutes down. As for DeRozan, I think his minutes will remain in the mid thirties. Barrington: LaMarcus seems to play better when he plays long stretches and gets into a rhythm. I think he’s playing near his optimum range. Normally, you worry about injuries for players getting extended minutes, but DeMar is so smooth, he doesn’t ever seem stressed or to be in a rush and I think he knows how to play withing himself, even when tired. I’m not really concerned about him playing a lot of minutes, but I think his minutes will go down some after Lonnie Walker gets back, just to give the rookie some experience. Dubinski: Considering all of his remaining guards are better as off-the-ball shooters than creators, he doesn’t have much of a choice with DeRozan until at least Derrick White comes back, but simply putting opponents away in a timely manner (Suns game) instead of letting them back in (Pelicans game) could help relieve them of some minutes. For Aldridge, Pop could probably find a way to stagger Cunningham and Rudy Gay at PF to give him more of a breather, but it will mostly boil down to the team getting healthy and finding a steady rotation. Both players’ minutes should eventually fall. Passos: Yes, and I think they’ll trend down as the team plays more back-to-backs and as Pop figures out what secondary rotations he likes more. Keeping those two as fresh as possible will be key, especially because both exert a lot of energy battling for position in the post and trying to beat their defenders to spots on the floor. Jakob Poeltl got a few minutes in the Orlando game and showed off his rebounding and defense. Should he be getting more minutes or is the rotation good as it is? Gomez: There’s just not room for him right now. Aldridge and Cunningham fit well in the starting lineup and Pau is needed to create for the second unit. I’m holding out hope that White’s return makes him relevant, as the two could make a great pick and roll duo, but I’m not sure that will happen. Barrington: It’s going to be driven by the matchup, not by his skill. Gasol is hurt right now, so he’s going to get some time to prove himself. He looked good against Orlando, so I hope he continues to demonstrate to the coaches that he belongs on the floor. Dubinski: There won’t be many minutes for him as long as the Spurs play small and Pau Gasol is playing as well as he is. Jesus described it the best in his piece on Poeltl and how with the personnel they have available, Gasol is just a better fit for an offensive-minded bench unit that lacks a distributor. He’ll find minutes during rest games or in the few match-ups in which Pop decides to go big, but for now he’ll just have to be patient, watch and learn — but still be ready at a moment’s notice like he was on Sunday. Passos: As long as the Spurs start games with Aldridge at the 5, it’s tough. They don’t appear to want to play Poeltl alongside Gasol in the second unit, which makes it more of an either/or scenario between the more versatile, floor-spacing veteran and the offensive-rebounding, rim-running young guy. Gasol fits better in a motion-heavy unit that includes Belinelli and Mills, but Poeltl’s also too talented to be racking up DNPs. Wilco: I like him, but I’d be surprised to see him play much this year lacking an injury or trade. Next year is another story. Biggest surprise so far: The Kings having a winning record, the Wizards looking like a lottery team or the Nuggets playing like a contender? Gomez: I’m going with the Wizards. The Kangz showed signs of life last season, with Fox, Hield and Bogdanovic leading the way from the perimeter, and they have talented young bigs. They will regress but could win 30+. The Nuggets were always going to be a problem when they cleaned up their defense and Jamal Murray started being more consistent. I did not see the Wizards being this bad. They are an emotionally fragile group, but they have a lot of talent and athleticism. Plus, they play in the East. I thought they were going to cruise to the playoffs. Now, I’m not so sure. Barrington: The Nuggets don’t surprise me, I knew they were going to be good. The Wizards are a little bit of a surprise, but they’ve always been a bit emotionally fragile, and without experience leadership, it was always a possibility that this would happen. The Kings are definitely the surprise of the lot. They dumped Boogie Cousins in February 2017, and it seems that it was addition by subtraction, although it took over a year for it to take effect. Dubinski: The Kings, by far. I’ve never been impressed with the Wizards, so seeing them underachieve is not too surprising. John Wall is not a leader, and there’s so many volatile personalities that it’s hard for them to come together when things get rough. The Nuggets having been brimming with potential for a while now, and with a good mix of young players and savvy veterans, they seem to be figuring it out. However, despite drafting some good players over the last several years, I would never have guessed the Kings would start so strong. They’ve never come anywhere close to putting it all together, and regardless of whether it lasts or not, this is a more surprising start to the season than the the other two. Passos: The Wizards should surprise no one, given the cocktail of personalities in that locker room. The Kings have the air of a team that catches opponents a bit off guard early but regress a little to where they should be. The Nuggets at 9-1? With a top five defense? It’s a little surprising, but it also makes sense with a strong, deep roster and a number of young guys coming into their own. I’m not sure they remain a top two team in the West, but top four definitely seems possible. Wilco: I’m surprised at how good the Nugs are, but I have to give this to the Kings. Fox is showing he has an incredible mind for the game, and that’s going to power Sacramento to some great runs. If they fall off and Denver solidifies their grip on the 2 seed, I reserve the right to flip-flop. Rudy Gay missed the games against the Magic and Heat due to the same heel issue that has bothered him for a while. How worried are you about this lingering injury? Should Gay just take time off until he’s fully healthy? Gomez: I’m a little worried because small injuries can take a toll in the long term. At the same time, Rudy has looked good when he’s suited up. I wouldn’t blame Pop for sitting him a few more games until he’s healthy, but if Rudy wants to play I’d say let him play. If the issue persists and he keeps missing one out of three or four games in December, then shutting him down might make more sense. Barrington: Once a big man has foot problems, there’s no point to waiting until you’re fully healthy, because you’ll never get there. It’s just a matter of controlling the issue so that the feet are stable and the pain is not bad. Rest is helpful, but it’s not the sort of thing just goes away, at least in my personal experience with my own size 13s. I trust the Spurs doctors not to put him out there too early, but I expect this to be a recurring issue for the rest of the season, if not his career. Dubinski: I’m dialing back the panic button since he told someone in the press (can’t remember who, but I saw it on Twitter during the Orlando game) that it was nothing major, he just banged it and needed 48 hrs to rest. He also said he could have gone against the Heat but Pop held yhim out. That being said, this is the second time (including the preseason) that his heel has “needed rest”. Is this just going to be a thing every now and then, or is there still some lingering issues that need to be dealt with? My guess is if it happens again, he should take some extra time off to get fully healthy. Passos: Yes, and probably. I can’t win a game of Operation, much less pretend to say I know how heel bursitis works, but there’s a lot of season ahead. Rudy is a gamer, and he’s once again in a contract-year situation, which may add to his desire to get out there and prove himself. That said, he’s an important part of what this team does and the lineups it cobbles together, and caution needs to be stressed early in the season. Wilco: I’ve been pretty worried since he missed the last preseason game because of it. Then he played all those games in a row and I thought maybe I’d overreacted. But now, two games in a row? It’s an issue and I’m crazy worried seeing as how the team seems to play their best 48 minutes only when he’s in the rotation. Participate in the discussion by posting your responses in the comments. Add a question for a future round table by emailing Jeph Duarte.